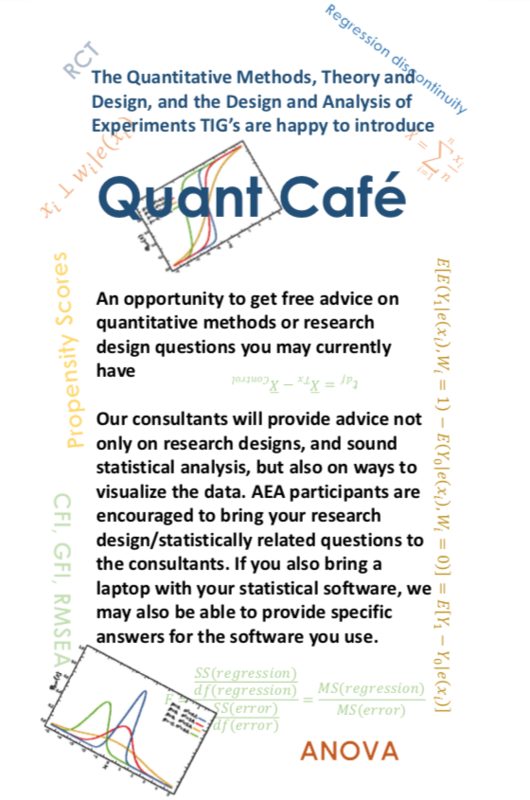 Welcome to the Quantitative Methods: Theory and Design Topical Interest Group (Quant TIG) Website! The mission of the AEA Quantitative Methods TIG is to support the effective use of quantitative methods in evaluation. This support is directed at members of this TIG, other members of AEA, and the evaluation community at large. In line with these three audiences, the goals are to help develop understanding of new and advanced techniques, provide training in core quantitative methods, and promote best practice in specific evaluation contexts. To pursue these goals, the primary activities of the Quant TIG are organizing conference sessions, promoting dialogue via a TIG listserv, and maintaining a website that facilitates sharing information on quantitative evaluation methods. Organizing AEA Conference Programs: The Quant TIG solicits and organizes sessions that, in order of priority, introduce and analyze advanced quantitative methods, provide training in well-established methods, and demonstrate applications of quantitative methods used appropriately in particular content areas. Promoting Dialogue: The Quant TIG emails its membership several times per year and organizes two listserv discussion forums. One discussion forum is open only to TIG members and focuses on TIG business and other issues that are of little interest to non-TIG members. The other discussion forum is open to all interested AEA members and non-members and addresses issues of broader interest. Maintaining the TIG Website: The Quant TIG maintains an AEA supported website that posts announcements, TIG-sponsored content, and links to other resources relevant for quantitative methods of evaluation. JOIN US ON SATURDAY AT 8:00 or 10:15! Copyright © Quantitative Methods: Theory and Design. All rights reserved.